Grass-fed ground beef is available at most of my local stores now, but the other cuts are harder to find, probably because they are more expensive and don’t sell as well. 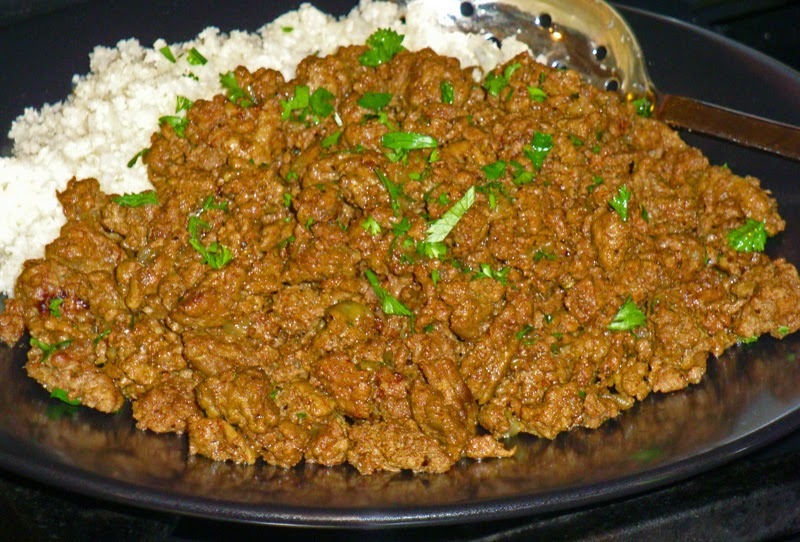 As a result, I use a lot of ground beef and am always looking for new ways to cook it. This classic Indian recipe makes a nice change from hamburgers, spaghetti, chili, and meatloaf. Heat the fat or oil in a large skillet over medium-high heat. Add the onions and cook and stir for 8 to 10 minutes or until evenly browned. Add garlic and ginger and continue to cook and stir for 2 minutes more. Add ground meat to skillet and cook until it starts to brown. Sprinkle turmeric, chili powder, and salt over meat and cook and stir for another minute or two. Add 1/4 cup hot broth or water, reduce heat to low, cover pan, and cook for about 25 minutes or until dry, stirring occasionally so it doesn’t burn. If all the liquid has not been absorbed, uncover the pan, raise the heat, and cook a little longer. Turn off the heat and stir in the Garam Masala, lemon juice, and cilantro or parsley. Garnish and serve hot. Note: Since this dish is somewhat dry, I like to serve it with a moist vegetable side or top it with yogurt or an Indian-style relish. The last time I made it, I served it with sauteed onions and cauliflower Faux rice, which complimented it perfectly! Fried okra is another traditional accompaniment. Use some or all of the spices on the list to make your own custom blend. When cooking with masala, add it to your dish toward the end of the cooking time. Toast spices in a skillet over a low-flame for about 2 minutes or until fragrant, shaking pan or stirring a few times. Let cool and grind to a powder in a spice grinder or with a mortar and pestle. Stored in an airtight container in a cool, dry place, the Garam Masala will remain potent for several months. Makes about 4 tablespoons. Net Carbohydrate will be less than 1 gram per teaspoon. Note: Garam masala means hot and spicy in the Hindi language. This aromatic blend of roasted spices from northern India varies from one region and even one family to another. This is a basic recipe including all or most of the possible ingredients, but you can alter it to suit yourself. It’s best when made from freshly ground, whole spices, but it is available ready made at most Asian markets and many supermarkets. If using a purchased mixture, toast it in a dry skillet for a minute or two to bring up the flavor. Masala recipe from Nourished; a Cookbook for Health, Weight Loss, and Metabolic Balance. Nourished is also available in Nook format from Barnes and Noble. Garam Masala Spice Blend. Bookmark. Is there a way to print this recipe without having a black background? If looks lie a great dish! rbrent, did you try printing it? My printer prints it as black on white. If yours reverses it, perhaps you can copy it and paste it on another page and print that one? If you open it on a mobile device, it loses the black background, so that might work too.